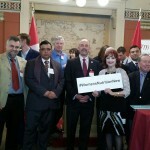 OTTAWA, May 17th, 2016 –The Honourable Dr. Asha Seth marked International Maternal and Newborn Health Week in Parliament by cohosting a reception with her parliamentary colleague Senator Norman Doyle. 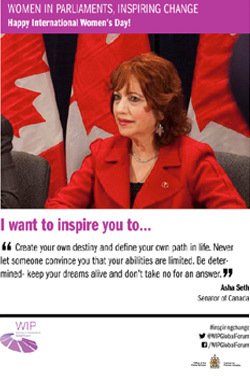 This annual celebration is a continuation of Senator Seth’s unanimously passed Senate motion to recognize the second week in May as a month to educate Canadians about issues that mothers and their children face, both at home and abroad. 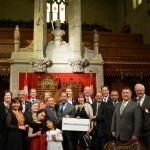 This year’s remembrance of International Maternal and Newborn Health Week had special significance that was two-fold. Firstly, it coincided with the triennial conference of Women Deliver- the foremost authority on issues relating to MNCH- taking place simultaneously in Copenhagen, Denmark. 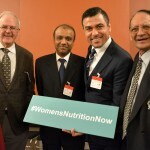 Secondly, it was the official launch of a platform created by Senator Asha Seth in collaboration with the Micronutrient Initiative entitled “Parliamentary Nutrition Champions”. 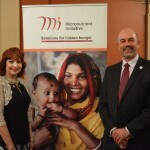 Speaking on the topic of “Women Deliver: Saving the lives of women and girls around the world” was Micronutrient Initiative Vice-President, Mr. Mark Fryars. Mr. Fryars spoke passionately about the tremendous work done worldwide by the Micronutrient Initiative, including areas that twenty-five years ago were plagued with both physical and mental disability due to malnutrition that today have seen great progress- with malnutrition eradicated in a generation by the proliferation of micronutrients. 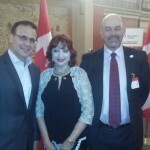 Mr. Fryars proudly expounded on Canada as a trailblazer at the frontier in the battle against malnutrition, and hailed the creation of the “Parliamentary Nutrition Champion” as vital allies in spreading awareness. 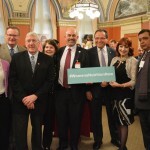 Statements were delivered in both in the Senate Chamber by event co-host Norman Doyle, and in the House of Commons by the Honourable Deepak Obhrai, Member of Parliament for Calgary Forest Lawn to mark the occasion of International Maternal and Newborn Health Week. Senator Jim Munson gave a passionate address on the topic of MNCH. Using the symbolism of a lighthouse (a homage to his grandfather who had been a lighthouse keeper in New Brunswick), he spoke of the transcending light which we must cast on issues of nutrition. 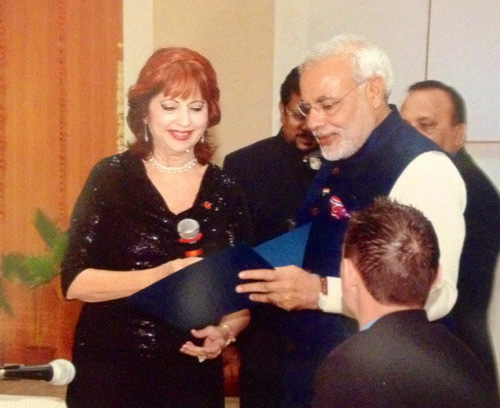 While malnutrition is by and large a global issue, he made clear reference that in some of our Native communities at home mothers struggle to provide for their children. In a moving personal story, he recounted watching a one year old child die before his eyes- emaciated, malnourished, and impoverished. 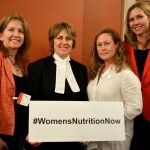 This image has stayed with him for over three decades, and has compelled him to become a Parliamentary Nutrition Champion. 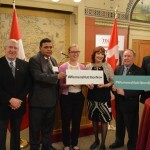 In an amazing show of unity on this non-partisan topic, both the Parliamentary Secretary to the Minister of International Development, MP Karina Gould, as well as the opposition critic for international development, MP Deepak Obhrai, appeared on the stage together. 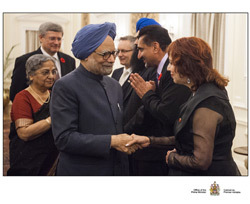 While they spoke separately, both expressed warm and cordial greetings, with verbalized support for MNCH both from the government and official opposition. International Maternal and Newborn Health Week is marked each year during the second week of May, coinciding with Mother’s Day.